Head west of D.C. for a less-congested holiday celebration in the village of Leesburg, where you'll find a five-story tree with more than 15,000 lights. 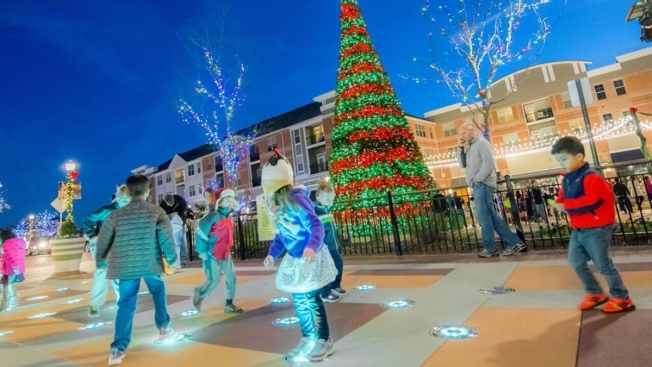 Leesburg will also play host to live music and plenty of holiday-themed events. This year, the village is celebrating the coming holidays with free horse-drawn carriage rides and breakfast with Santa at participating restos. Kids can visit with Santa and Mrs. Claus, enjoy breakfast or lunch and receive a photo and souvenir. Spectacular Musical Tree Shows: Daily music and light shows through Jan. 3, noon-9 p.m. every hour on the hour. Visit with Santa: Wednesdays and Thursdays now through Dec. 17 from 5:30 to 7:30 p.m. (bring your own camera). Wednesdays are pet-friendly. International TUBACHRISTMAS Concert: A flashmob-esque group of tuba players will gather and playing Christmas music, Dec. 13 from 2-3 p.m.
Hanukkah Celebration: Dec. 13 at 4 p.m. Annual Winter Ice Fest & Mega Block Ice Carving Competition: Jan. 16; more details to come. 9 a.m. & 10:30 a.m.
8:30 a.m. & 10 a.m.
You are also encouraged to bring a donation for Toys for Tots. The Village at Leesburg is centered around 1602 Village Market Blvd. SE, about an hour from downtown D.C.